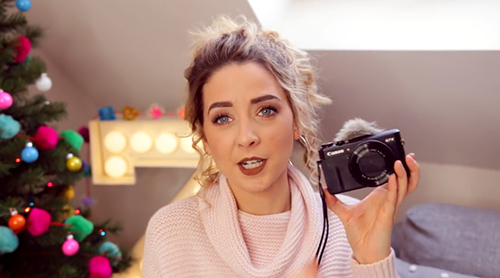 Featured in Zoella's 'What's in my bag 2016' special - watch what she says about it here! "I love it - I really love it, it goes everywhere with me!" "I've been looking for a long time for something to enable me to use my camera in windy conditions. Finding the Micromuff products has literally changed my life! I've use it in strong windy conditions and the audio is perfect!" "Gimmicky name, quirky look but incredibly effective windscreen for your outdoor video shoots. Once we got over the tongue-in-cheek name, we found that this little furry chap is brilliant at eliminating wind noise from the built-in microphone when shooting video. 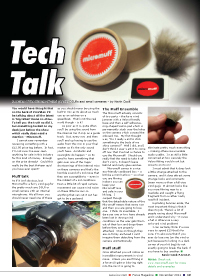 Micromuff is made from high quality acoustic fur and attaches with supplied Velcro rings. One 16mm ring sits on the camera around the outside of the microphone (6mm circle cut-out exposes microphone) and the Micromuff is backed with a Velcro circle. It's detachable and reusable and comes in its own case to keep it clean when not in use." "Once attached you will notice an incredible improvement in wind noise. Unless you are filming in a force-10 gale or blowing right into the mic it is going to eliminate pretty much everything – making otherwise unusable audio usable. ..the most important thing is that it does its job. There’s a lot of people raving about Micromuff and I understand why - it cures what is otherwise a very awkward wind problem! I can certainly think if worse ways to spend £13 that’s for sure. I’m also sure that if you ever do lose one (on the wind or just because its lurking in a dark corner of your kit bag) its not exactly going to break the bank if you have to buy another "
"It looks like a mini badger brush and has arguably the greatest name in gadgetry. What’s not to like?" In professional film and TV productions, there’s always a bloke holding a stick with a cat on top of it. He’s called the boom operator. The stick is the boom and the cat is a microphone wearing a massive afro wig. The wig stops the wind bodging up the soundtrack. When the producers of grumpy doctor series House shot their billionth(ish) episode on an SLR (a Canon EOS 5D Mark II, since you ask) they used a boom operator. You don’t have one, which means your lovingly shot footage – steeped in moody bokeh – has an unwanted atmospheric addition: wind noise. 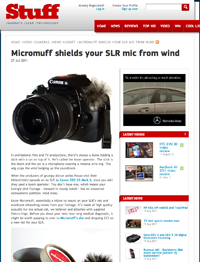 Enter Micromuff, essentially a kitten to mount on your SLR’s mic and eradicate whooshing noises from your footage. It’s made of high quality acoustic fur (no actual cat, we believe) and attaches with supplied Velcro rings. Before you shoot your next hour-long medical diagnostic, it might be worth popping to over to Micromuff’s site and dropping £13 on a new hat for your SLR. "Yes it’s called muff, and we can hear you giggling from here. If you’re partial to the occasional spot of video, the Micromuff is a godsend, thanks to its ability to muffle the cameraman’s worst enemy, wind. 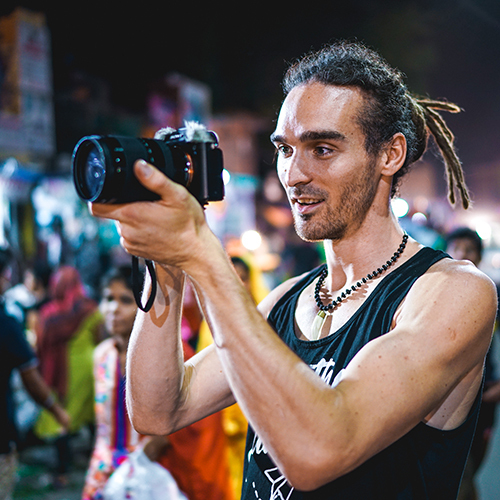 Affordable and easy to use – all cameras should have them as standard." "the Micromuff Skinny Deadcat is definitely effective at reducing wind noise. It’s also obvious that it doesn’t magically eliminate it. It does however do a good enough job to allow Plural Eyes to work it’s magic and create a multiclip of multiple camera footage." " It’s not a rocket-science product but it WORKS really well. Take a look and listen to this short video I shot. The first part is with NO MicroMuff attached. Then you can hear me placing the MicroMuff on my camera. The latter part of the video you can hear the wind blowing through the trees and the wind-chimes but none of the ugly noise of the wind hitting the on-camera mic. Do yourself a huge favor and get yourself one, or two." "I really love how it performs, as seen in the test in the end, it outperforms my expectations. Don't worry about the the Velcro sticking on your body, it doesn't leave any sticky behind. Also a hole in the middle to actually capture audio. For only £12.95, it is a great deal! Don't miss out and grab one for your DSLR!" Being able to shoot hi-def video on your DSLR is pretty great; it can save you a ton on equipment. But like anything else where you’re saving some money, there are sacrifices to be made. In this case, we’re talking about audio quality. Wind noise can ruin your video if you’re not using an external mic setup. Well now there’s another solution: Micromuff (£13/$22), from the company of the same name. "It's a great idea for those using the built in microphone on the AGC enabled DSLRs outdoors. Its totally worth the price and can actually make the on camera microphone somewhat useable again." "it definitely reduces wind noise, and should eliminate it completely in all but the most challenging of situations." "Got mine the other day and to be honest I was very dubious, I mean how can that thing stop wind from appearing on my videos? Well, it does, brilliantly!" "I bought the wind jammer from @micromuff @WexTweets apart from it looking like Sir Patrick Moores eyebrow it actually works great!" 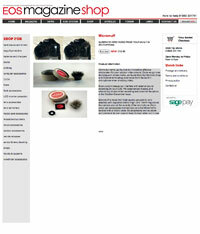 Micromuff is distributed exclusively in the UK by JP Distribution.